Think for a moment about the successful leaders you know. Chances are they all have one quality in common - the ability to communicate effectively. It is important that people develop this ability early in life so that they may successfully meet the challenges of adulthood and leadership. The Youth Leadership Programme helps young people develop their communication and leadership skills so that they may become tomorrow's leaders in business, industry and community. 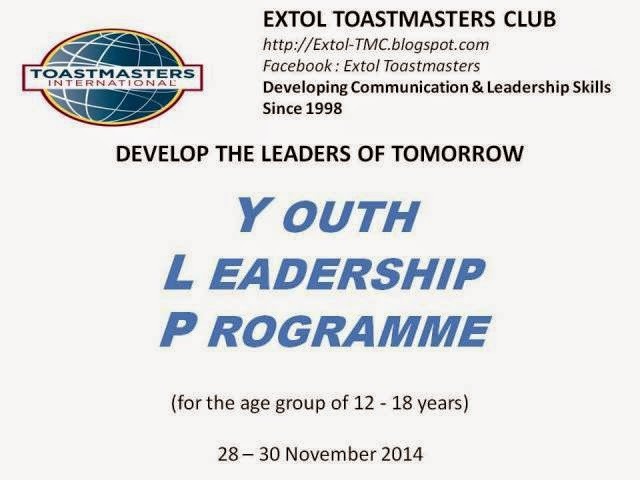 The course is conducted by members of the EXTOL Toastmasters Club of Subang Jaya as part of their community programme. Youths in the age group of 12 - 18 years can participate in the programme. This programme is limited to 30 people. This allows each participant to receive individual attention and the opportunity to get practical experience. Learn the ability "to think on your feet"
YES! I wish to participate in the above programme. All registrations MUST be accompanied with payment and is on a first-come-first served basis. Extol Toastmasters Club reserves the right to cancel this programme due to unforeseen circumstances. In this event, a full refund of fees will be made.  If notice of withdrawal is given in writing 1 week BEFORE commencement of the programme, 50% refund will be made.  If notice of withdrawal is given in writing WITHIN a week preceeding commencement of this programme 25% refund will be made.  If notice of withdrawal is given in writing on THE DAY / AFTER the commencement of this programme, no refund will be made.